HomePersonality Type JournalDonald Trump’s Evolving Personality? In an earlier article on Trump and Clinton’s Personality Styles, written prior to the Presidential election, I predicted that if elected Trump “. . . will morph into a kinder, softer version of what we have seen during the campaign.” Compared to running the election campaign where a “. . . winner-take-all battle . 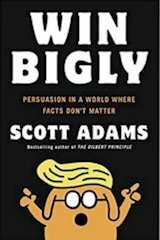 . . brought out all of his competitive impulses” I believed the “job of President is a different ball game, where things like consensus, cooperation, negotiation and win-win are important to success” and I expected Trump to adapt to this NEW circumstance. Philip H recently wrote me taking issue with parts of previous articles on Trump. One of his comments was his view that “70 years old ESTPs (ENFPs) don’t change, particularly when they are, by type, not given to introspection or second guessing.” That’s an interesting point that I’ll take up later in this article. Whether ESTPs can change or not, Philip’s comment does point out that Trump morphing into a “kinder, softer version” and less competitive version of himself hasn’t exactly happened! In my December 2016 Trump 2.0 article I predicted it will be “Trump the Negotiator not Trump the Entertainer who will be running the new show.” Yet Trump the entertainer hasn’t gone underground, this face still makes an appearance. I am also seeing less diplomacy and more hard-ball negotiation than I thought I’d see. While I still believe Trump employs both a “good cop” and a “bad cop” persona when the situation exists, it seems in the media we see mostly “bad cop.” It is a scenario that I am well familiar with having spent part of my career (14 years) in labor negotiations and labor relations. Union leaders often employ a hard-line and often polarizing public face. Even behind closed doors at the negotiating table, you’ll see this posturing. But in key more private circumstances, away from the table, you discover the fire-breathing union rep is a lot more rational and understanding of your viewpoint than you figured. He pounds on you to soften you up but will adopt a different mode when it is time to really do the deal. So I think Trump is adapting to his circumstances, as we would expect an ESTP would adapt. But it is the environment and circumstances that block his adopting a softer, more cooperative, and win-win style. One area that I expected the consensus, cooperation-building Trump to show up was with Russia, finding areas of common ground for cooperation even though we strongly compete in other spheres with the Soviet Union. “Russia, Russia, Russia the evil empire trying to rig our election . . .” and related memes spawned by the Clinton election defeat reprisals and general adversarial political climate has made this an impossible dream. The Russia and Russia-Trump conspiracy narrative has helped push Trump back into a competitive, combative, and win-at-all costs style. He’s got enemies in the other party, enemies in his own party, and enemies in most of the traditional media. The escalating North Korean situation also brings out the hard-line Trump persona. Will Trump Change or Can He Change? In Trump’s case I don’t think losing skirmishes with his many opponents or others setbacks will provide an incentive for self-examination and change. It is consistent with his ESTP personality to not concede defeat until the game has concluded. And even then, it may be hard. Confidence in being able to win against long odds is a dominant ESTP characteristic. And as we have mentioned before, even for ESTPs Trump is on the tail end of the normal curve distribution. He is very extraverted, very self-confident and as writer Philip indicated self-examination is not associated with most ESTPs. Trump’s style has engendered a strong emotional or visceral opposition among many. We are not used to seeing ESTPs as our political leaders and in particular a unique ESTP like Donald Trump. His unpredictable, unbridled style stokes imagined fears. His public persona has some believe he is truly “unfit” or an abomination. The political establishment on both sides fear if we allow people like Trump to be successful as President that will only encourage the future election of people like him, at all levels of the political spectrum. And Trump’s competitive, unfiltered media comments and war with traditional media hasn’t won any converts. So what are the implications if the pressure on Trump increases and conflicts worsen. What would happen if the forces against Trump become overwhelming? What would happen if he believes he is losing, with no chance of winning? Will he change? 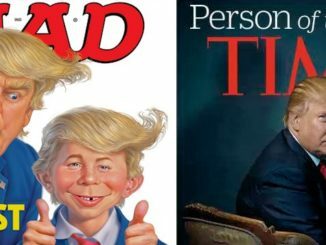 What Would be Trump’s “new personality” if he did change? Among credentialed, professional users of the MBTI and personality type, there is clinical experience with the effects of great stress on personality. It can bring to the forefront a shadow personality. This shadow type is a mirror image of the person’s particular personality type pattern. 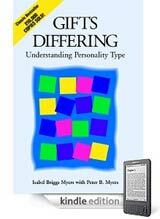 Each of the 16 personality types has a different shadow personality type. 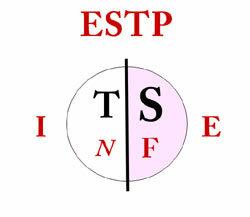 ESTPs dominant mental facility is Extraverted Sensing, supported by Introverted Thinking. 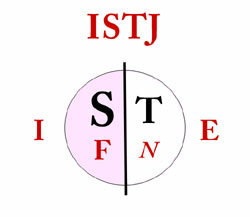 ISTJ is the shadow personality to ESTP. Its dominant mental facility is Introverted Sensing, supported by Extraverted Thinking. The Shadow personality type of ESTP is ISTJ. So if the stress on Trump gets too great and he perceives clearly that he is losing, he may flip to operating on his shadow side. His presidential style would then more resemble John Adams, our most famous ISTJ President. The “new” Trump, while different, will only be liked by some of the Republican “Never-Trumpers” who want a more conservative, buttoned-down, predictable, draw-between-the-lines type of guy. The “new” Trump would not be any more liked by Democrats nor the Media. He would not be perceived as a more “feeling” type nor seen as favoring improved social justice. He would be perceived as more resistant to change, less willing to negotiate. A President “John Adams” would not use twitter and would be much more cautious in his public statements. But he would be, on principle, clearly conservative on social change, government sponsored welfare programs, open-borders, open immigration, etc. On matters of policy, he’d be more polar opposite than Trump to the policies favored by the Democratic party and the numerous identity groups who align with the party. So Trump’s left-leaning and even far-left opponents should watch out for getting what you wished for! Rather than asking an ESTP to change his spots to become a different type, we should encourage growth on his ESTP platform. Actually, Trump may evolve into being more “Presidential” if he has less opposition from his political and media opponents and if he has more success. It is easier to be magnanimous when you are winning, much harder when you are under fire. And with more acceptance and less strident opposition, Trump’s “Feeling” side of his personality will have more room to grow. He won’t flip to his shadow side, but more fully develop his ESTP nature. The natural faculties for development by an ESTP are his extraverted Feeling and introverted Intuition. An Idealist waiting to break out. What a concept! December 20, 2016 Ross Reinhold Personality Type Journal Comments Off on Donald Trump ESTJ Personality?